Well I made a run to Old Navy today....as my Little Man was in serious need of a new pair of slippers!! I had been everywhere on the planet (or so it it seemed anyway) over the past 2 weeks with no luck!! Well, success today!! I found him a really cool pair for just $4.17!! What a deal!! Anyway while I was there I browsed around the store a bit and ended up finding some really great clearance deals!! They had many, many clearance racks in every department with savings up to 75% off regular prices! I ended up with 9 items for just $21.94! 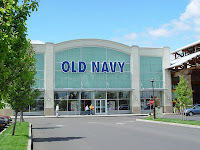 To save even more.....be sure to print this Old Navy Weekly coupon here (expires 1/7) and take it with you....(Hint: if you give Heather 5 stars up pops a great money saving coupon to save you $5 off a $25 purchase). Your store may have different items on clearance than mine did, or perhaps not....but it's worth checking out if you are nearby an Old Navy store over the next few days!! Ahhh! Is this the 50% off clearance sale I wait for every year??? And the old navy online coupons NEVER work for me!! They are always gone when I try.